Join the discussion on our forums! Come discuss Kara Kazham! over in our dedicated Kara Kazham! discussion topic. Summon a 1/1 Candle, 2/2 Broom, and 3/3 Teapot. This is what happens when you tell Khadgar to set the table. 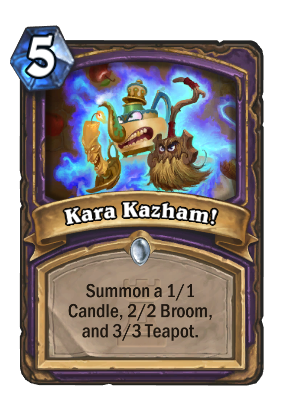 Recently in Wild i met Aggrolock that used Bloodbloom into Kara Kazham! orDemonheart for some insane pressure swings on turn 2-3. It may be not best or most efficient playstyle, but it was quite awesome to watch. Needless to say, since I played fun and not very fast deck he utterly crushed me twice in a row. Is this the best use for Bloodbloom? This card has actually been amazing for me in arena. I've gotten four 7-9 win decks on the back of 2-3 copies of this card. 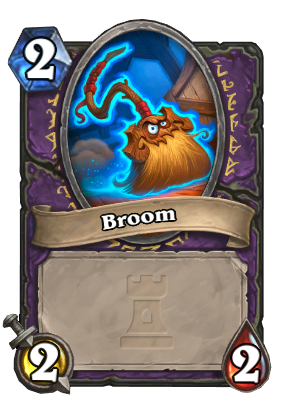 Literally useless it is 5 mana yet gives 6 mana worth 3 minion look at Call of the Wild it is 8 mana summons 9 mana worth but minions have taunt charge and buff. Huffer it is better than Leeroy Jenkins Misha Leokk. So this is why Kara Kazham! is worthless. Warlock cards on the whole are the least powerful class cards in each of their slots because the hero power is so good. The card is not amazing but not exactly worthless. It's 6/6 broken up into 3 bodies which is actually a benefit since multiple bodies tends to make it harder for control decks to clean up without a board clear as well as synergizes with cards like Juggler and Darkshire, it's a spell so it synergizes with most spell related things such as the Arcane Giant, and it does in fact belong to the warlock whom has possibly the best possible hero power of the bunch. 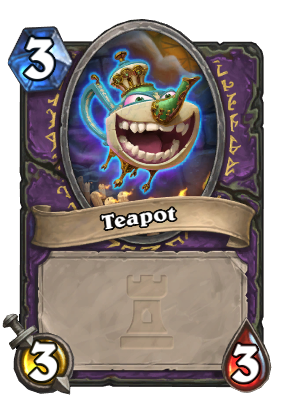 While YES, the minions from Call of the Wild ARE better, it is more of a late game card at 8 mana, Call of the Wild is an epic while this is common (which is important since this card will eventually be craftable for Wild players), and also, without Life Tap, you have less likely of a chance to get the card without putting a bunch of draw in your deck. It's more the fact of the warlock is more consistent as to why their cards are weaker. 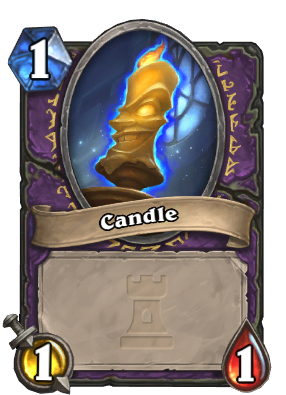 So while this card isn't the best card AND it doesn't fit too well into any current warlock decks, it's not entirely worthless. It has potential but it'd take a bit of experimenting to find that potential. Nope they just start to use warlock as trash bin, they need cards for other mods or for cards such as Yogg, But doesn't fit to any class hey just make it a Warlock card right! Warlock suppose to use portals not furnitures. ...you are actually comparing class cards? Especially with Call of the Wild, which was specifically designed to carry on its own the late game of a whole class in the upper tiers? No I am saying that if you want to make Kara Kazham! worth to play like call of wilds at least give one of the tokens taunt and make tokens demon or something like that. tokens are vanilla it is just 5 mana 6/6 and doesn't make any difference since you can since buff darkshire councilor to 3 attack for same value you can still make knife juggler throw 3 blades for same value. Lol. Power Overwhelming is a card.